Things are a little busy around here – more on that later. For now, I share with you a favorite recipe that’s perfect for the fall. 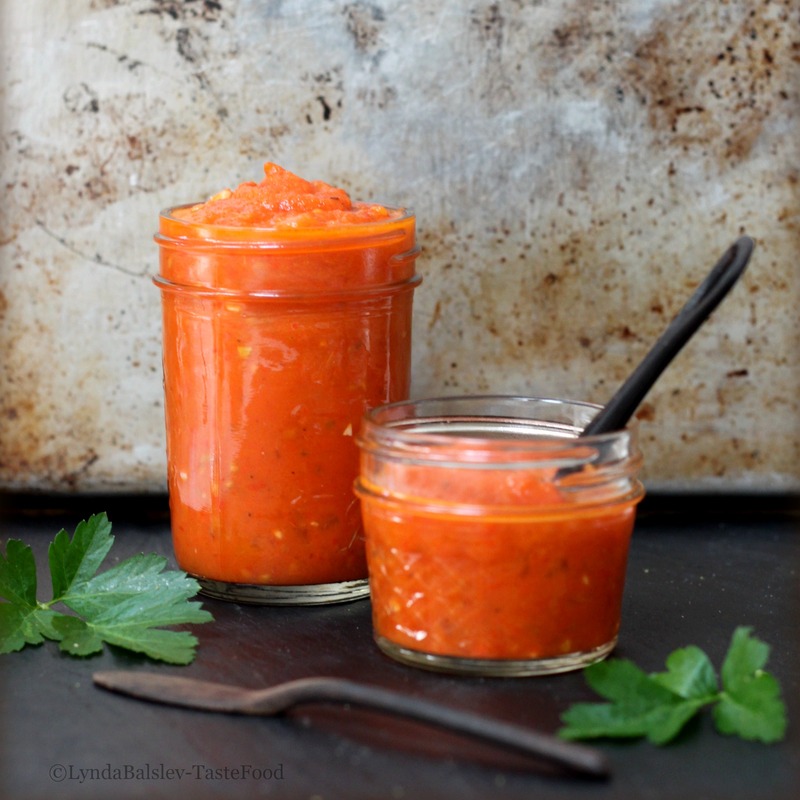 It’s also perfect for busy schedules, when you can make a big batch of the sauce and keep it on hand for weeknight dinners. If you don’t have a recipe like this in your weeknight repertoire, then you should. We refer to it as Spaghetti Bolognese in our house, and before someone writes to inform me that this is not an authentic bolognese sauce, I’ll save you the time and announce it right here: This is not an authentic bolognese sauce – but it’s our version, and somewhere along the way it was assigned the name “bolognese” (probably my fault) and since then it’s stuck. More importantly, my entire family loves this sauce, and we’ve become quite attached to it’s name, so we’re are standing by it. 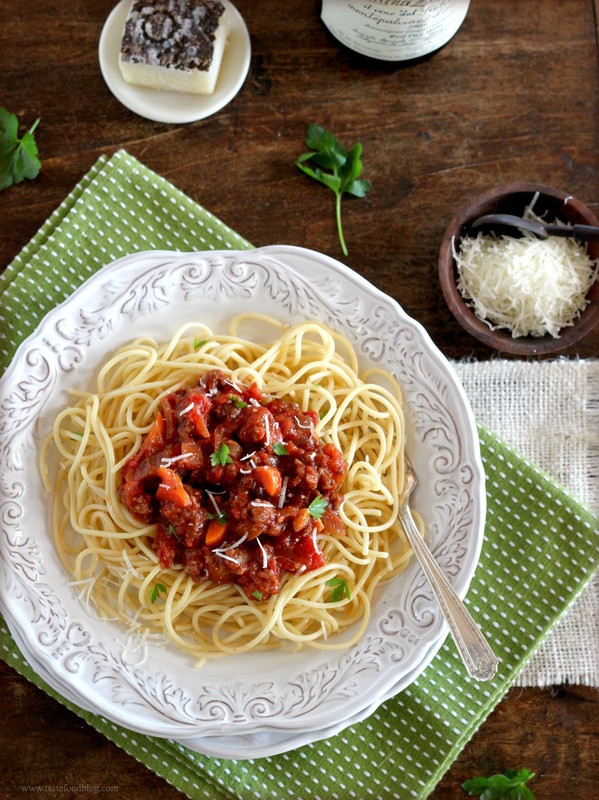 Bolognese sauce is a meat ragu, often containing 2 to 3 kinds of meat (beef, pork, veal). My sauce calls for ground beef since it’s most readily available in organic, sustainable form in all of the markets I shop. If you wish, feel free to add pork, pancetta or veal to the mix. 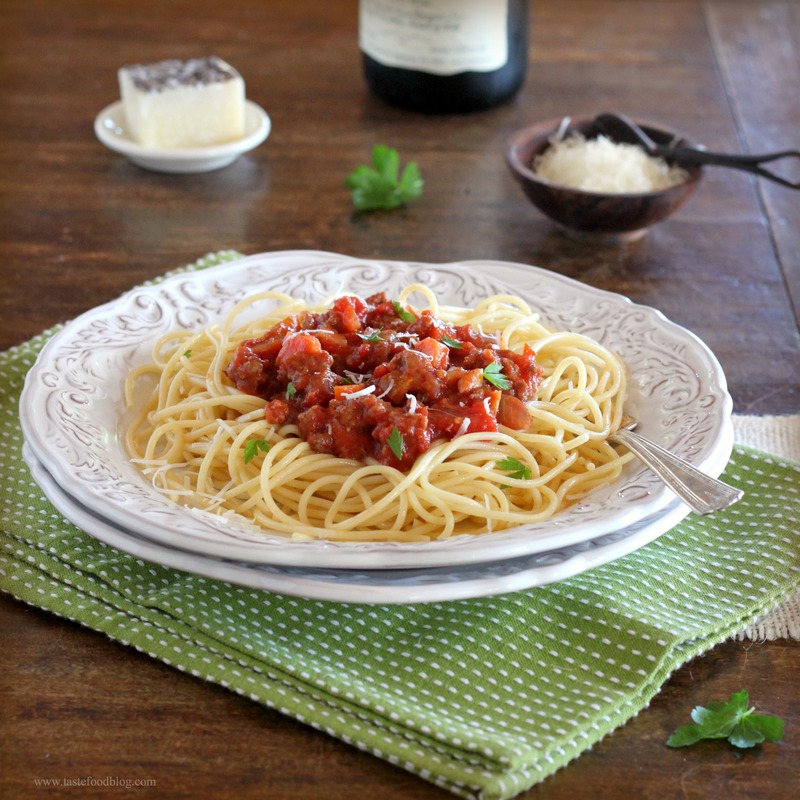 Bolognese is typically not a tomato-rich sauce. The meat is the principal component, which is why it’s a ragu. My version is generous with the tomatoes, because, well, we like tomatoes, and we are happy to call our sauce a sauce. Bolognese spices are minimal: salt, pepper, bay leaf, nutmeg – and no garlic (gasp). You can be sure there will be garlic in my sauce, along with a handful of my garden’s herbs, such as oregano and thyme. Bolognese includes white wine and milk – yes milk. Neither are in this sauce – otherwise, at least one young family member would have rebelled years ago due to a mystifying bias against dairy. Instead, I add red wine, because it deepens flavor and acidity to meaty sauces, and (for some reason) there’s always red wine in our house. Finally, bolognese is a hearty ragu, often served with thick hearty-type pasta such as pappardelle. We love pappardelle, but, unlike red wine, there’s rarely pappardelle in our house, so spaghetti is the go-to staple of choice. The point here is this is a flexible sauce that tastes great no matter it’s name or its origin. More importantly, it’s a family staple that’s hugely popular, may be prepared in large quantities, easily frozen, and is unfussy in its use: Ladle it over pasta, between lasagna sheets or even call it a base for chili. It may be prepared within an hour for easy weeknight dining and tastes even better the next day. This recipe may be doubled. Freeze the extras for later use. Heat 1 tablespoon olive oil in a large pot over medium-high heat. Add the beef and cook, stirring, until brown, about 3 minutes. Drain the beef in a colander. Return the pot to the stove and add 1 tablespoon oil. Add the onion and cook over medium heat until beginning to soften, stirring up any brown bits, 1 to 2 minutes. Add the carrot, celery, red pepper, and garlic. Sauté until the vegetables soften and brighten in color, about 2 minutes. Add the wine and deglaze the pan, stirring up any brown bits. Add the tomatoes, bay leaf, thyme, oregano, salt and pepper. Return the beef to the sauce. Bring to a boil, then reduce heat to medium-low. Simmer, partially covered, stirring occasionally and breaking up any of the tomatoes with a wooden spoon, about 30 minutes. Taste for seasoning and add the sugar if necessary. Serve ladled over cooked pasta, such as spaghetti, pappardelle, or rigatoni. Garnish with fresh parsley and serve with grated cheese. Are you looking for an easy and healthy weeknight meal? 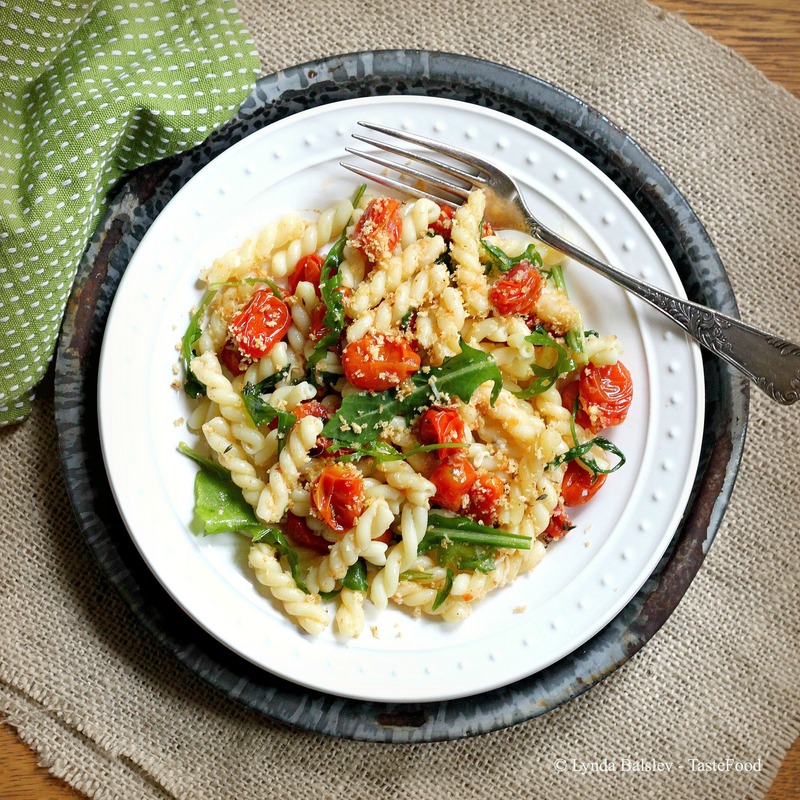 Here is a light and fresh pasta dinner that may be prepared in 30 minutes. I make this recipe frequently, especially when I have gads of tomatoes on hand – which at this time of year is all the time. Slow roasting coaxes out their natural juices and sugars and heightens their flavor. Fresh arugula is tossed into the mix, slightly wilting from the heat of the cooked pasta. The final touch is a shower of toasted olive oil breadcrumbs, which add a comforting and richly delicious crunch to the dish. 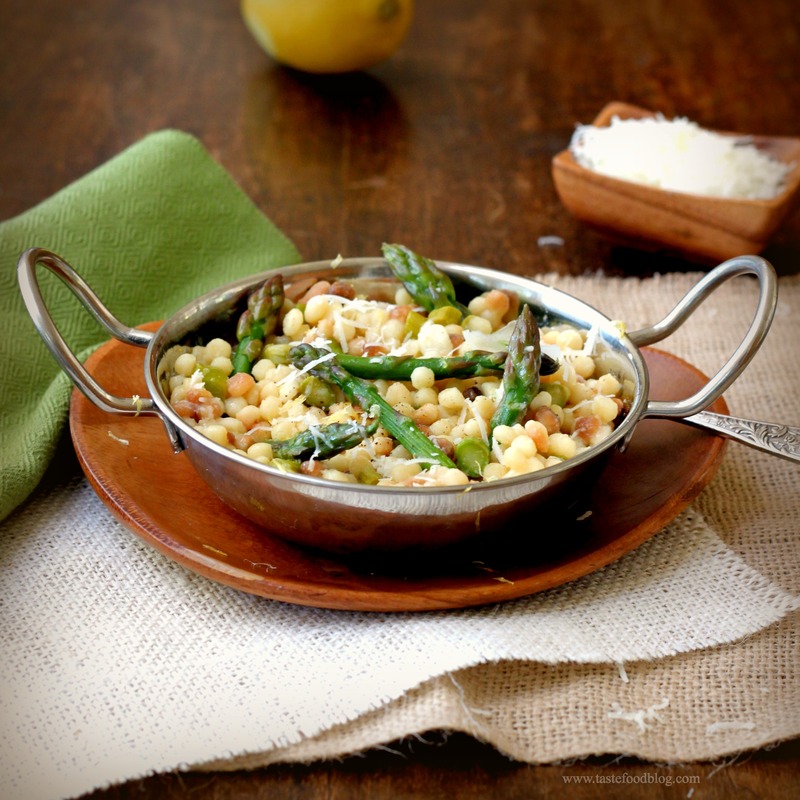 Have you ever tried Fregola Sarda? You should. Fregola is a semolina pasta hailing from Sardinia, Italy. What distinguishes fregola is its shape and flavor. The pasta are rolled balls which are sun-dried and toasted, similar to pearl or Israeli couscous. Their unique shape and texture lend well to soups and salads. I find their nuttiness so addictive and satisfying, I like to keep my preparations simple to allow their toasty flavor to shine through. This dish is light and bright, inspired by the fresh asparagus and lemons in season now at the farmers markets. Bring a large pot of salted water to a rolling boil. Add the fregola and cook until al dente, about 10 minutes or per package instructions. Drain and transfer to a large bowl. Add 1 tablespoon olive oil, the lemon zest and 1/2 teaspoon salt and toss to coat. Cut the stalks of the asparagus into 1/2-inch pieces while keeping the tips intact. Heat 1 tablespoon olive oil in a large skillet over medium heat. Add the shallot and saute until softened, about 2 minutes. Add the garlic and chili flakes and saute until fragrant, about 30 seconds. Add the asparagus stalks and tips. Season with 1/2 teaspoon salt and 1/2 teaspoon black pepper. Saute until asparagus brightens in color, about 2 minutes. Add the chicken stock and continue to cook, stirring occasionally, until asparagus are crisp tender and most of the liquid has evaporated. Remove from heat and add to the fregola. Add the Pecorino and toss to combine. If the fregola are too sticky, add 1 tablespoon olive oil. Serve warm with additional black pepper. There is something infinitely satisfying about presenting a complete dinner heaped on one platter. The arrangement suggests a family-style feast. It’s a fun method for casual dining, which allows everyone to dig into a balanced meal combining meat, greens, and grains, or in this case, noodles. This Asian-inspired recipe embraces budget friendly skirt steak, a flavorful cut of meat that loves a good marinade, piled over a tangle of noodles. A sweet and sour marinade is perfumed with lemongrass, a key ingredient in Thai and Vietnamese cuisine, which infuses the meat with flavor and spice. The longer the beef marinates the better the flavor, but that’s the only time consuming step in making this dish, which requires little effort – only advance planning. Lemongrass, also known as citronella, is commonly used to flavor stir-fries, marinades, and curries. It looks like a woody spring onion and has a uniquely fragrant lemon-floral flavor concentrated in the oils in the centers of its stalk. For the purpose of a marinade, the stalk need only be sliced to release its flavor. For other dishes where the lemongrass is eaten, the outer stalks should be removed and the center stalks minced or pounded to a paste. Lemongrass is sold in the fresh produce section of Asian markets or well-stocked supermarketsand the other marinade and dressing ingredients are available in the international section of well-stocked grocery stores and in Asian supermarkets. If you can’t find fresh lemongrass in the produce section, it’s also sold as a jarred paste. Simply add 1 tablespoon of the paste to the marinade. Once the ingredients are on hand, this dish comes together quickly for a family-friendly weeknight dinner that will have everyone reaching for seconds. 1. Combine the marinade ingredients in a large bowl and whisk to blend. Slice the skirt steak on the diagonal against the grain into 1-inch strips. Add to the marinade and toss to coat. Cover the bowl with plastic and refrigerate at for least 2 hours or up to 24 hours. Remove the steak from the refrigerator 30 minutes before proceeding with recipe. 2. Cook the noodles until al dente per manufacturer’s instructions. Drain and transfer to a bowl. While the noodles are cooking, whisk the dressing ingredients in a small bowl. Pour half of the dressing over the drained noodles and toss to thoroughly coat. 3. Heat 1 tablespoon oil in a cast iron skillet over medium-high heat. Add the skirt steak in batches without overcrowding the pan. (The steak may also be grilled over direct medium-high heat.) Sear the steak on both sides until cooked to your desired doneness, 2 to 3 minutes each side for medium-rare. Transfer to a plate and repeat with the remaining meat. 4. To serve, spread the noodles on a serving platter or in a shallow serving bowl. Arrange the skirt steak strips over the noodles and scatter the chile pepper, cilantro, mint, and sesame seeds over and around the steak. Garnish with the lime wedges and drizzle the remaining sauce over the steak and noodles. Serve warm.